Keeping Christmas plants alive and thriving in the new year and beyond is possible with the right care. But there are also the little plants that guests keep showing up with - poinsettias, Christmas cactus and the like. The guest presents the little fella (cyclamen, azalea, paper white, whatever) at the door - and the sprout really does look quite festive in his white wicker basket and bright red bow. But a week later, he's all slumped over looking like the Ghost of Christmas Past. The problem is that most of these holiday plants do not really want to be indoors at ll. They want to be outside - preferably in some tropical clime (don't we all?). But under right conditions, Christmas flowers and plants can survive a month inside - even with you. These Christmas plant care tips can help. 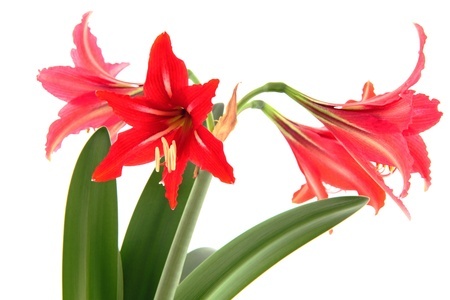 The plant we call "amaryllis" is not really an amaryllis but a Hippeastrum hybrid. The real Amaryllis belladonna is in the lily family - you probably know it as "Naked Ladies". But that's another story. Your faux amaryllis will require a warm place with bright light but not full sun. Keep soil evenly moist but not wet. The bloom should last six to eight weeks. Some azaleas are bred as greenhouse plants but they're still a bit tricky to keep alive indoors. Keep it moist, cool (45 to 60 degrees at least at night - maybe the garage?) and away from heat ducts. It needs bright light but no direct sun. Mist, remove dead flowers and cross your fingers. Yes, Virginia, there really is a Christmas cactus - and it's a different critter from the oft-confused Easter cactus - though they look much alike. The trick to telling them apart: Christmas cactus has more pointed leaves and the Easter cactus leaves are more scalloped. The easiest way to tell is that the Christmas cactus usually blooms at Christmas and Easter cactus usually blooms at Easter. As my kids would say, "Duh!" These are types of cactus called "forest cactus" because in the wild, they grow on trees in tropical forests. Put them in a bright window and water when the top of the soil begins to dry out. Capsicum annum is descended from chili and cayenne peppers so the fruit's too hot to eat and are purely ornamental. It needs some direct sunlight, and don't let it dry out between waterings. Mist occasionally and keep the plant in a cool spot (away from heater vents) and the fruits should last two or three months. Keep the soil moist but don't wet the crown of the plant. Mist occasionally and pinch off spent flowers to keep them blooming for months. This member of the succulent family needs to be placed in bright but not direct sun. Keep it cool and out of drafts. Water thoroughly and then let it completely dry out before you water again; no misting necessary. Narcissus tazetta. These are a type of daffodil that grow easily in a shallow container of water anchored by stones. For best results, place them in a cool spot in bright but not direct sunlight and enjoy. Euphorbia pulcherrima now comes in many colors - white, red, pink, variegated. Treat it right and the flowers (really bracts or colored leaves) should last two to six months. This plant will thrive in a warm (65 to 75 degree F) well-lighted spot away from drafty windows and doors. Water only when soil is dry. Mist leaves regularly. Good luck with your gifts! With proper plant care, they can be kept throughout the year to bloom again next Christmas. But that's another holiday plants story.